Summertime is tagine time at our house because summer is when laziness rules supreme. Tagines are a lazy cooks sort of dish; you heat the tagine, add the first group of components, wait, add the second group of components, wait some more, and then eat. This is perfect for those summer days where you really have more pressing things than cooking on your mind (such as yard work or laying in a hammock). If you have a side burner on your grill, you get the added benefit of not heating the house up when you cook. 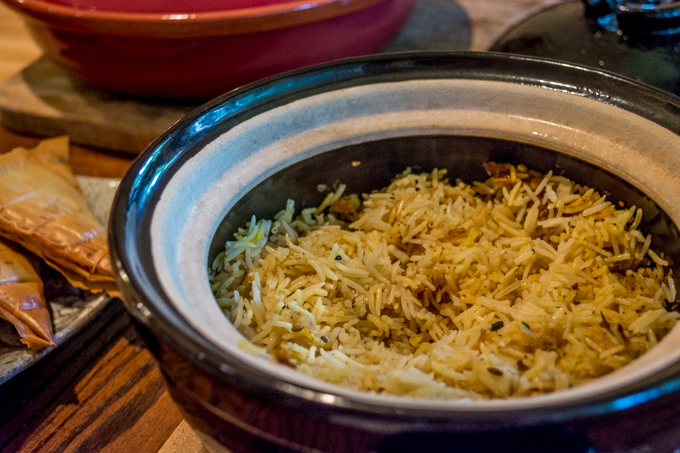 This dish leans on the flowery flavor of Basmati rice to back up a pretty solid blend of spices. It is light in texture and fills the role of a pilaf for those times where you really don’t want to expend much effort in your side dishes. Simply drop all the stuff in the pot, bring it to a boil, lid it up and simmer for about 15 to 20 minutes. The rice will continue to cooks somewhat after you remove it from the heat. If you use a clay pot rice cooker to cook this dish, the slacker effect is amplified, since the rice will stay hot right at the table while your prepare the rest of the meal. There are a couple of ingredients that may be not massively common in this dish. The first is orange flower water, which provides a nice astringency to the dish and the second is the spice blend ras el hanout. Both can be had by mail order, although if you really wanted to, you could blend up your own ras el hanout from a recipe such as this. It is a great blend of spices that is used extensively in Moroccan and Middle Eastern cooking. It is not overly hot and provides a wonderfully complex profile of flavor, especially when paired with the saffron. At the end of the day this is a pretty handy base recipe that can be thrown together with spices selected to match your main dish. 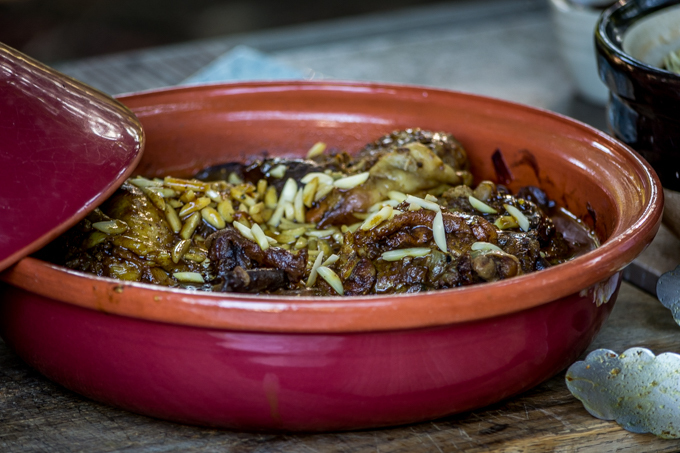 In our case, our main was a tagine of chicken with dates and figs. The rice needed to be have enough punch to cut through the sweetness of the fruit. I have also cooked a version that used lime and cumin flavors instead. Adapt at will; just maintain the 1 to 1 1/2 proportion of rice to water, use oil (or butter), be liberal with your flavors, and, above all, have fun. Combine ingredients in a medium sauce pan or preferably in a clay rice pot. Heat to a boil, reduce heat to a simmer and cover tightly. Simmer rice for between 15 and 20 minutes. Remove from heat and allow to rest for about 20 minutes prior to serving. Rice will continue to steam during this time. Clam chowder is sort of tough. 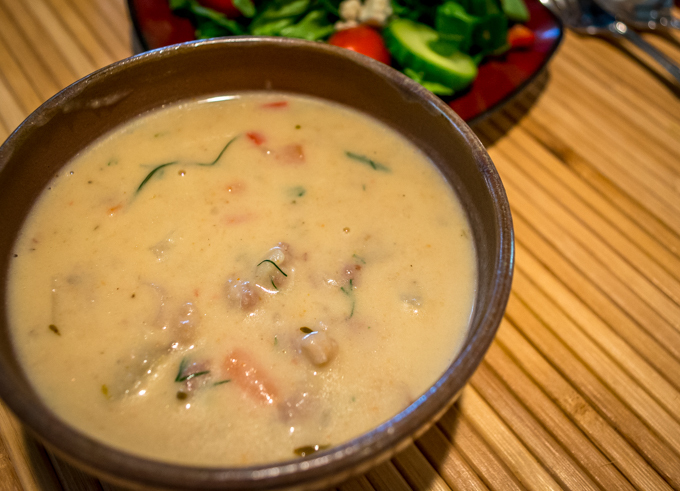 Sure, anyone can make potato soup with some clam scraps….just add enough bacon and it will be fine, right? I have to say that this sort of clam chowder is, well, offensive. It has no individuality, no style and no identity. You could likely pour a better version out of a can. There is quite a challenge to be had in trying to make a dish like clam chowder unique. The main issue is that you really need to work within the parameters of the dish. You need to make something that, at the end of the day can be easily identified as clam chowder yet have something tangible that is your own. When you are dealing with a cream-based clam soup with potatoes, there is simply not much room to work. You need to keep the clams, the potatoes, enough of the cream to keep the soup rich, and get it thick without allowing it to get starchy, or worse, breaking the soup. This is a pretty tight box to work in…and a challenge worth taking on. Although the chowder at road-side stands along the coast is wonderful (and it really is), there is everything right about creating something that reflects a bit of yourself….